This article is about the cathedral. For the marzipan sweets, see frutta martorana. 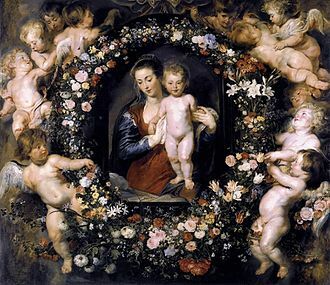 The church is characterized by the multiplicity of styles that meet, because, with the succession of centuries, it was enriched by various other tastes in art, architecture and culture. 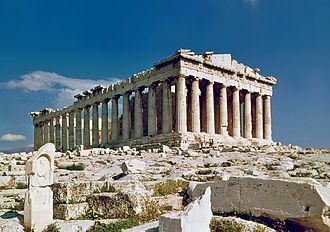 Today, it is, in fact, as a church-historical monument, the result of multiple transformations, also subject to protection. 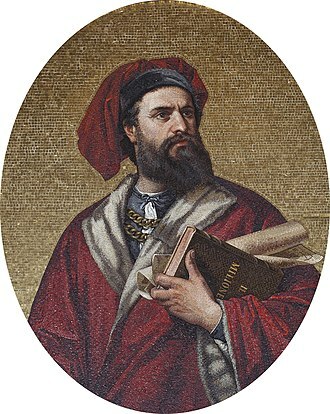 The name Ammiraglio ("admiral") derives from the founder of the church, the Greek admiral and principal minister of King Roger II of Sicily, George of Antioch. 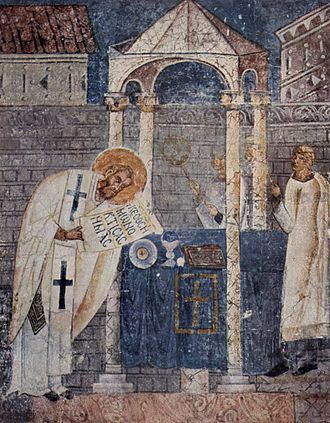 The foundation charter of the church (which was initially Eastern Orthodox), in Greek and Arabic, is preserved and dates to 1143; construction may already have begun at this point. The church had certainly been completed by the death of George in 1151, and he and his wife were interred in the narthex. In 1184 the Arab traveller Ibn Jubayr visited the church, and later devoted a significant portion of his description of Palermo to its praise, describing it as "the most beautiful monument in the world." 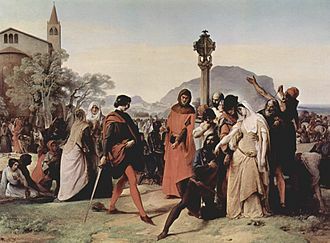 After the Sicilian Vespers of 1282 the island's nobility gathered in the church for a meeting that resulted in the Sicilian crown being offered to Peter III of Aragon. 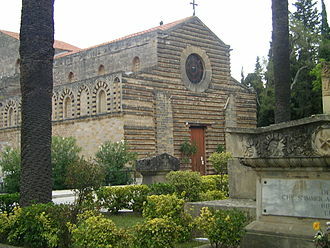 In 1935 Benito Mussolini returned the church to the control of Palermo's Christian community of the Byzantine rite. 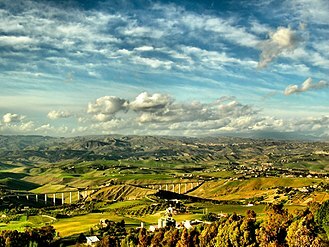 Today, it is used by the Italo-Greek Catholic Church for their services and shares cathedral status with the church of San Demetrio in Piana degli Albanesi. 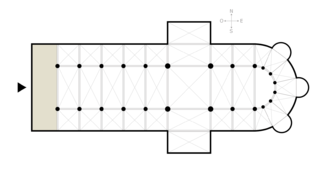 The original church was built in the form of a compact cross-in-square ("Greek cross plan"), a common south Italian and Sicilian variation on the standard middle Byzantine church type. The three apses in the east adjoin directly on the naos, instead of being separated by an additional bay, as was usual in contemporary Byzantine architecture in the Balkans and Asia Minor. In the first century of its existence the church was expanded in three distinct phases; first through the addition of a narthex to house the tombs of George of Antioch and his wife; next through the addition of a forehall; and finally through the construction of a centrally-aligned campanile at the west. The campanile, which is richly decorated with three orders of arches and lodges with mullioned windows, still serves as the main entrance to the church. Significant later additions to the church include the Baroque façade which today faces onto the piazza. In the late 19th century, historically-minded restorers attempted to return the church to its original state, although many elements of the Baroque modifications remain. 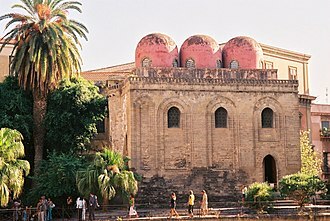 Certain elements of the original church, in particular its exterior decoration, show the influence of Islamic architecture on the culture of Norman Sicily. A frieze bearing a dedicatory inscription runs along the top of the exterior walls; although its text is in Greek, its architectural form references the Islamic architecture of north Africa. 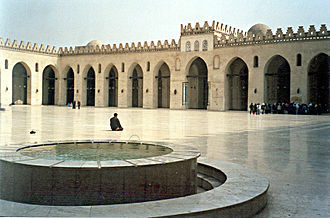 The recessed niches on the exterior walls are likewise derive from the Islamic architectural tradition. In the interior, a series of wooden beams at the base of the dome bear a painted inscription in Arabic; the text is derived from the Christian liturgy (the Epinikios Hymn and the Great Doxology). The church also boasted an elaborate pair of carved wooden doors, today installed in the south façade of the western extension, which relate strongly to the artistic traditions of Fatimid north Africa. On account of these "Arabic" elements, the Martorana has been compared with its Palermitan contemporary, the Cappella Palatina, which exhibits a similar hybrid of Byzantine and Islamic forms. The interior of the Martorana, before restoration (19th-century paintings). The church is renowned for its spectacular interior, which is dominated by a series of 12th century mosaics executed by Byzantine craftsmen. 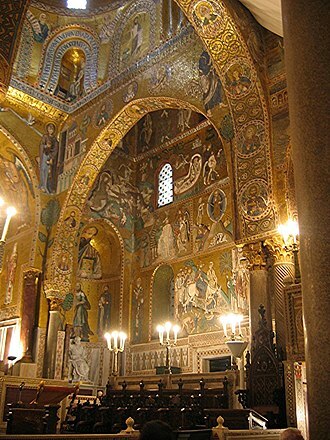 The mosaics show many iconographic and formal similarities to the roughly contemporary programs in the Cappella Palatina, in Monreale Cathedral and in Cefalù Cathedral, although they were probably executed by a distinct atelier. The walls display two mosaics taken from the original Norman façade, depicting King Roger II, George of Antioch's lord, receiving the crown of Sicily from Jesus, and, on the northern side of the aisle, George himself, at the feet of the Virgin. 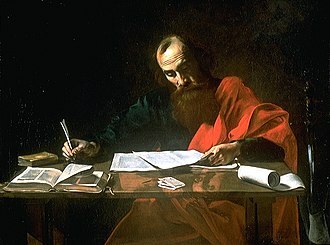 The depiction of Roger was highly significant in terms of its iconography. 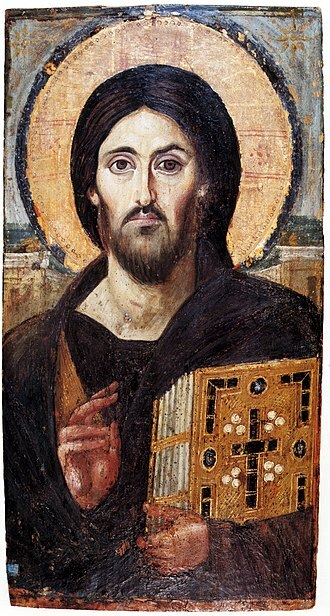 In Western Christian tradition, kings were customarily crowned by the Pope or his representatives; however, Roger is shown in Byzantine dress being crowned by Jesus in the Byzantine fashion. 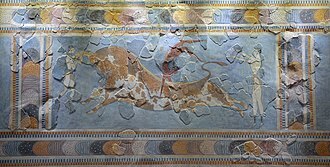 Roger was renowned for presenting himself as an emperor during his reign, being addressed as basileus ("king" in Greek). 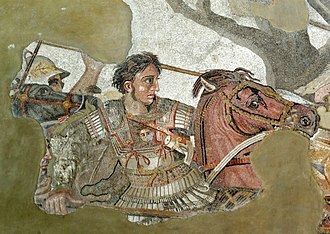 The mosaic of the crowning of Roger carries a Greco-Latin inscription written in Greek characters (Rogerios Rex ΡΟΓΕΡΙΟΣ ΡΗΞ "king Roger"). ^ "Concatedral Santa Maria dell'Ammiraglio, Palermo, Palermo, Italy (Italo-Albanese)". 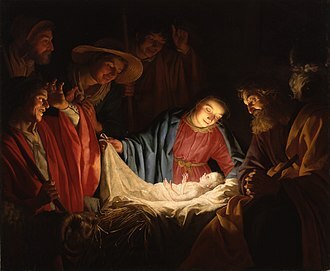 www.gcatholic.org. Retrieved 2017-01-25. ^ For the text of the inscription, see Lavagnini, "L'epigramma." 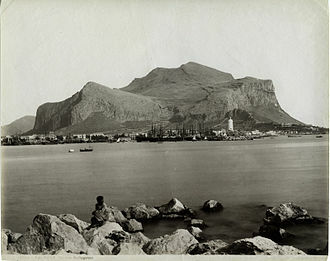 Wikimedia Commons has media related to La Martorana (Palermo). B. Lavagnini, "L'epigramma e il committente," Dumbarton Oaks Papers 41 (1987), 339-50. Roger II was King of Sicily, son of Roger I of Sicily and successor to his brother Simon. He began his rule as Count of Sicily in 1105, became Duke of Apulia and Calabria in 1127, by the time of his death at the age of 58, Roger had succeeded in uniting all the Norman conquests in Italy into one kingdom with a strong centralized government. By 999, Norman adventurers had arrived in southern Italy, by 1016, they were involved in the complex local politics where Lombards were fighting against the Byzantine Empire. Roger I ruled the County of Sicily at the time of the birth of his youngest son, Roger, at Mileto, Calabria, in 1095. Roger Is nephew, Roger Borsa, was the Duke of Apulia and Calabria, alongside these three major rulers were a large number of minor counts, who effectively exercised sovereign power in their own localities. These counts at least nominally owed allegiance to one of these three Norman rulers, but such allegiance was usually weak and often ignored, when Roger I died in 1101, his young son, Simon of Hauteville, became Count, with his mother Adelaide del Vasto as regent. Simon died four years in 1105, at the age of 12, Adelaide continued as regent to her younger son Roger, who was just nine years old. 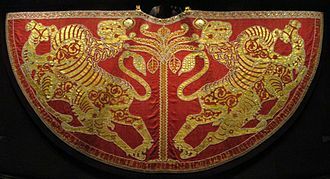 Upon the death of his brother, Simon of Hauteville, in 1105, Roger inherited the County of Sicily under the regency of his mother. 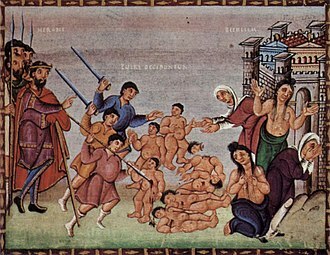 His mother was assisted by such notables as Christodulus, the Greek emir of Palermo, in 1109, Byzantine Emperor Alexios I Komnenos, bestowed upon him the title of protonobilissimos, in recognition of his knowledge of the Byzantine court. In the summer of 1110, Roger was visited by the Norwegian king Sigurd Jorsalfare, the story suggests that Sigurd gave Roger the name King of Sicily, twenty years before he actually obtained this title. In 1112, at the age of sixteen, Roger began his rule, being named now knight, now Count of Sicily. In 1117, his mother, who had married Baldwin I of Jerusalem, returned to Sicily, Roger seems to have felt the slight, and this might explain his reluctance to go crusading. Roger married his first wife, daughter of Alfonso VI of Castile, and his queen, who may be identical to his former concubine. Uriel is one of the archangels of post-Exilic Rabbinic tradition, and of certain Christian traditions. In apocryphal and occult works, Uriel has been equated or confused with Urial, Uryan, Vretil, Suriel, Phanuel, the angels mentioned in the older books of the Hebrew Bible are without names. Indeed, rabbi Simeon ben Lakish of Tiberias, asserted that all the names for the angels were brought back by the Jews from Babylon. Raphael features prominently in the deuterocanonical Book of Tobit, the Book of Tobit is accepted as scriptural by the Roman Catholic Church, the Eastern Orthodox Church, and the Oriental Orthodox Church. Where a fourth archangel is added to the three, to represent the four cardinal points, Uriel is generally the fourth. 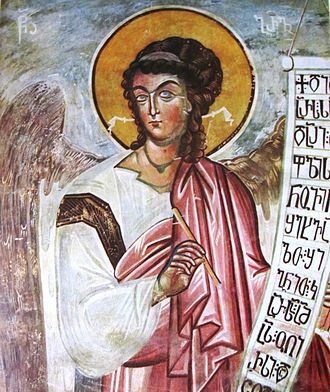 Uriel is listed as the angel in Christian Gnostics, by Gregory the Great. However, the Book of Enoch clearly distinguishes the two Angels, Uriel means the Light of God while Phanuel means the Face of God, Uriel is the third angel listed in the Testament of Solomon, the fourth being Sabrael. Uriel appears in the Second Book of Esdras found in the Biblical apocrypha in which the prophet Ezra asks God a series of questions, and Uriel is sent by God to instruct him. According to the Revelation of Esdras, the angels that will rule at the end of the world are Michael, Uriel, Gabuthelon, Zebuleon and Arphugitonos. The last five listed only appear in book and nowhere else in apocryphal or apocalyptic works. 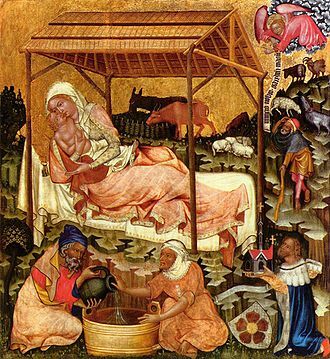 In Christian apocryphal gospels Uriel plays a role, differing sources, in the rescue of Jesus cousin John the Baptist from the Massacre of the Innocents ordered by King Herod. He carries John and his mother Saint Elizabeth to join the Holy Family after their Flight into Egypt and their reunion is depicted in Leonardo da Vincis Virgin of the Rocks. Uriel is often identified as a cherub and angel of repentance and he stands at the Gate of Eden with a fiery sword, or as the angel who watches over thunder and terror. In the Apocalypse of Peter he appears as the Angel of Repentance, in the Life of Adam and Eve, Uriel is regarded as the spirit of the third chapter of Genesis. Traditionally the narthex was a part of the church building, but was not considered part of the church proper. 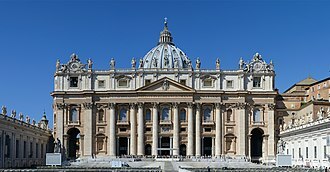 Peters Basilica in Rome or in the Basilica of SantAmbrogio in Milan, the exonarthex may have been either open or enclosed, with a door leading to the outside as in the Byzantiine Chora Church. By extension, the narthex can denote a covered porch or entrance to a building, the word comes from narthex and was the place for penitents. In Modern Greek narthekas no longer has meaning and is either the porch of a church, as English. In English the narthex is now the porch outside the church at the west end, the purpose of the narthex was to allow those not eligible for admittance into the general congregation to hear and partake in the service. In the Russian Orthodox Church funerals are held in the narthex. Later reforms removed the requirement to exclude people from services who were not full members of the congregation, Church architects continued, however, to build a room before the entrance of the nave. Cathedral of St. Michael and St. Gudula in Brussels, Belgium. Co-Cathedral of the Sacred Heart in Houston, Texas. The interior of the church of Santa Maria dell'Ammiraglio in Palermo, founded by George of Antioch. The Admiral's Bridge in Palermo. Seal of George of Antioch, bearing the titles of his offices (archōn archontōn and amēras) in Greek. (Ncilona) Traditional Arbëresh costume worn during the wedding ceremony performed according to the Byzantine rite. Women in typical Albanian costume of Piana degli Albanesi, historical photo dates to the end of the 19th century.